If you’re looking for an interesting, adventurous and good value self-drive holiday then Romania has a lot to offer. Wander the cobbled streets of medieval towns such as Brasov, go on a bear-spotting walk in Craiului National Park and taste local wine at a vineyard in Urlati. Then when you’re done with the sights, head to the Danube Delta where you can explore by boat or kayak, or simply relax by the pool. Fly to Bucharest from Liverpool and take a private transfer to your hotel. Romania’s capital is dynamic, energetic and fun. It’s where still-unreconstructed communism meets unbridled capitalism; where the soporific forces of the EU meet the passions of the Balkans. Collect your car from the Airport before setting off to Brasov. 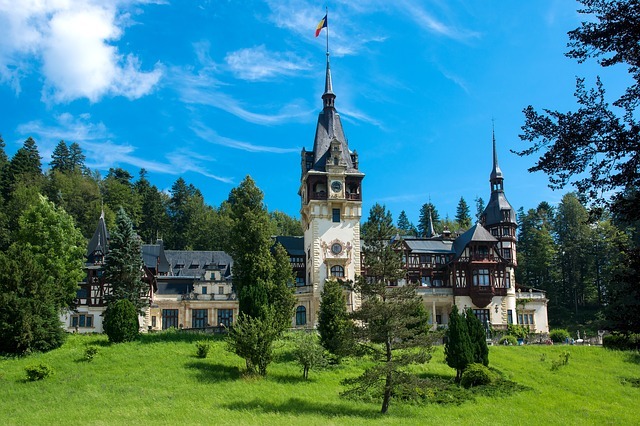 En route you will visit Peles castle in Sinaia and the Pearl of The Carpathians; The Peles Palace – the Royal Summer Residence. Once at Brasov try to visit the old centre. If you have time, perhaps take the cable car to Mount Tampa for a beautiful view of Brasov. The walking tour of the old town will bring you closer to the Old Market Square, the Black Church, Rope Street and on the small streets of the old Medieval town. Find out about the fortification system, the citadel and first Romanian school. Continue the self-guided tour in the morning to the medieval peasant fortress of Rasnov, build on the top of the nearby hill. A great 360 degrees panorama reveals from it’s highest point, with superb views towards Bucegi mountains and Piatra Craiului national park. Visit the Bran castle, the most famous castle in Romania, where you will learn about Count Dracula’s legend. There are many pretty villages in the area to explore. Visit Bran village or Simon village, or head to the hills of Magura village; the perfect destination for those who love hiking, trekking and walks, but also for those who want to enjoy the silence, contemplating nature. Guided by an experienced Forest Ranger you will be taken to a bear hide in Piatra Craiului National Park to observe bears in their natural habitat. Drive Viscri, a remote rural village that is also home to a small Saxon community. Visit the great fortified church – a UNESCO site, and local workshops including a traditional village blacksmith and charcoal maker. You can also have a ride with horse & cart and enjoy a traditional home-cooked meal. In the evening admire the cows returning home to each house. Explore the nearby villages of Crit and Mesendorf, both small and charming places, surrounded by hills. Enjoy a guided walk on the hills, starting from Crit and arriving in Viscri, (the trip includes car transfer from Viscri to Crit). The medieval village of Sighisoara sits just 30 miles from Viscri. Once there visit the Clock Tower, the History Museum, the Medieval Arms Collection, the Torture Room Museum, the Church on the Hill and restaurant Casa Dracula. Sibiu is awash in aristocratic elegance. Noble Saxon history emanates from every art nouveau facade and its gold-embossed church. Renowned composers Strauss, Brahms and Liszt all played here during the 19th century, and Sibiu has stayed at the forefront of Romania’s cultural scene through its festivals of opera, theatre and film, as well as rock, jazz and more. The country’s first hospital, school, library and pharmacy were all established here, and locals are justly proud of the spirit of enterprise that endures to this day. Consider a visit to the Astra National Museum of the traditional folk civilisation. Visit a local winery and sample some Romanian wines in the charming village of Urlati. Early in the morning start driving towards Murighiol where you will leave your car and take a boat transfer to the Green Village in the Danube Delta. Relax and enjoy the facilities of the stunning Green Village resort, situated where the mighty Danube meets the Black Sea. Facilities include an outdoor pool and organic gardens. Check out of Green Village and take a boat transfer back to Murighiol to collect your car. From there, drive towards Buzau (with the option to take the car ferry over the Danube). Enjoy a brief stop in the small city of Buzau before continuing on to your accommodation in Berca, close to the Mud Volcano – a geological and botanical reservation. Return car at RIN Airport Hotel before private transfer to the airport for your flight home. Bed and Breakfast in a standard room in Romania's Capital, Bucharest. Bed and Breakfast in a standard room in this picturesque hotel in Brasov. Standard double, room and breakfast in the heart of a mediaeval village. Standard double, with breakfast included in this riverside hotel in Sibiu . Standard double room with breakfast in this charming hotel in Urlati. Why not stay for a couple of days and enjoy Romania’s bustling capital, Bucharest? *Based on two people sharing a room with flights from Liverpool.